Piece Camp is a day camp for children with Autism, Asperger's, Developmental, Speech/Language, and Social Delays. It's time for the 12th annual Piece Camp! This social skills camp is called 'Piece Camp' because in so many of our children the social connection is the missing 'piece'. Piece Camp serves children ages 2 and up. For more information on this exciting opportunity, please contact Julie Allison at piececamp@aol.com. 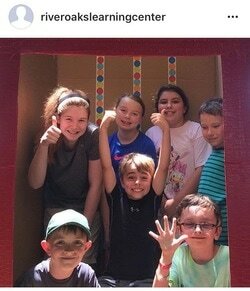 Make sure to follow us on Instagram at riveroakslearningcenter and on Facebook at River Oaks Learning Center to see all the fun pictures! Piece Camp is unique because it offers neuro-typical children as peer models. We also have a 4:1 camper to counselor ratio. Campers are provided opportunities to develop new friendships, initiate conversation, express feelings appropriately, learn to 'read' people, control impulsivities, and collaborate with a group to work toward a common goal. Our overall goal for Piece Camp is for campers to find social and emotional growth in a supportive environment.